Portland, OR. Fifteen Portland Rose Festival Princesses are making the rounds at local businesses, special events and celebrations. The 2017 court is a standout for its diversity. 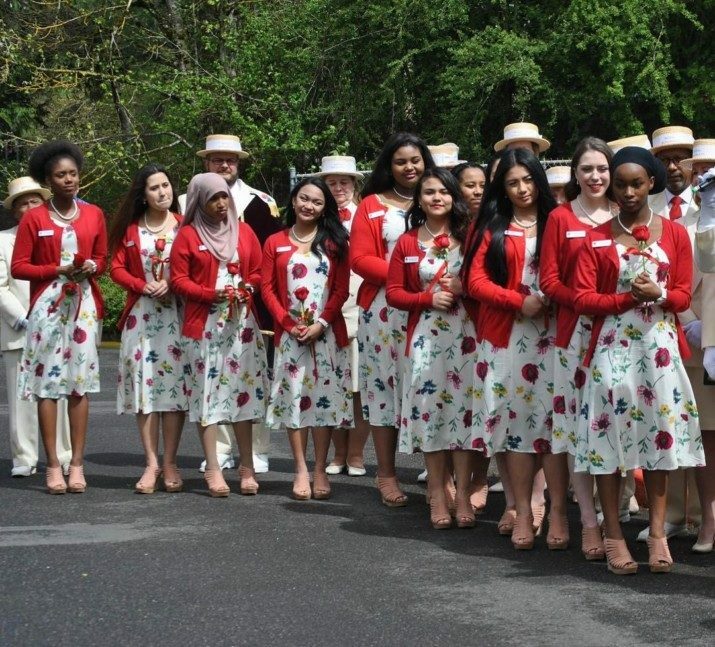 At a blessing by Archbishop Alexander Sample, he explained how the group has the opportunity to “honor diversity but celebrate our unity as a wonderful community of love, respect, and peace.” The 2017 Rose Festival court is made up almost entirely of young women of color. Five of the princesses were born outside of the country, representing Kenya, China, the Philippines and Ethiopia. Court members were at the Delta Park Elmer’s Restaurant to help spread the word about “Rose Meals.” For each Rose Meal purchased at 12 participating restaurants through June 25th, Elmer’s will donate $1 to the Portland Rose Festival Foundation. Since the program began in 2010, Elmer’s has raised $86,907 for the Rose Festival Foundation. The Rose Festival Court is comprised of up to 15 young women chosen from Portland Metro-area high schools. After their selection court members travel full-time 5 days a week for 5 weeks, visiting community events, business leaders, hospitals, senior living centers, youth organizations and civic groups. Court Members also receive one-on-one mentorship, a $3,500 scholarship provided by The Randall Group, and a complete wardrobe. The Rose Festival Court is presented by Unitus Community Credit Union. The Rose Festival Queen is chosen from the Court and is crowned at the Queen’s Coronation. The Queen represents Portland and the Rose Festival for one year at appearances throughout the country and abroad. The Coronation will be held just before the Grand Flora Parade on June 10th. On April 23rd, members of the Rose Festival Court made their first public appearance at the annual Blessing of Festival. Here’s more information on members of the 2017 Rose Festival Court. Would You Like to be a Member of the 2013 Portland Rose Festival Court? Thank you for this wonderful coverage of this year’s Portland Rose Festival Court. They are truly a remarkable group of accomplished, young women.